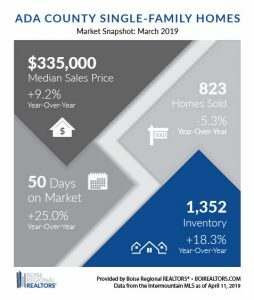 Single family home sales continue to keep pace as evidenced by the latest Intermountain MLS real estate report for March 2019. The data provided in the report shows an increasing median sales price of $335,000 for single family homes. This is up over 9% from last year. This median price is pushed up in large part because of the price of new homes. The increase in home prices has an ancillary affect on the rental market in the valley. Due to increasing home prices, many renters are unable to qualify for home ownership. Even in the case of a dual income household, the increasing home prices are not allowing for home purchases by some tenants. Tenants are, consequently, forced to wait out the market, or hope for corresponding increases in wages, neither of which seem to be viable options. Part of this increase is due to the lack of inventory currently available to home buyers. Inventory for March sat at around 1,352 which remains very low. Inventory is expresses in terms of months of inventory when it comes to home purchasing. A healthy market enjoys an MSI (Months Supply of Inventory) of around 4-6 months. The latest March report showed an MSI in Ada County of 1.3. With a lower MSI, would-be buyers do not have available homes to choose from. This dynamic adds increasing rent price pressure on rentals, especially on single family homes. For investors, who own single family homes, the market is so good that many are electing to step out of being landlord in order to capture the market equity of their rental property. This, in turn, reduces the number single family rentals on the market which further drives up the demand and price of single family rental homes. The bottom line is that the local market continues to be favorable for real estate sellers and continues to put pressure on would-be real estate buyers and tenants. The question moving forward will be what does the market look like for the immediate few months moving into the summer months. We anticipate that the market will continue with this trend through the end of this year. The data is in: the Treasure Valley housing market is buyer centric showing continuing signs of strength. While several data points show strong indications of a good market, some month-over-month slowing in sales has occurred. This information is based on a recent monthly real estate sales report capturing the December sales data comparative to November 2018. In Ada County, the median home price continues to increase month over month, edging up another 1.3% to a whopping $317,372 median home price. As a professional in the rent industry, this increasing home price makes it progressively cost prohibitive for first time home buyers to get into the market. Many tenants, who would like to get out of a rental property, are unable to due to the cost of purchasing a home. In most cases renters are dependent upon a strong dual income household in order to qualify for a home purchase. Consequently, tenants continue to wait out the market to see if there is any softening. On the investor side of the equation, this market presents an opportune time to liquidate equity and take advantage of high home prices. In our property management portfolio alone we have experienced as much as 10% of our single family properties selling off due to favorable market conditions. I was anticipating this number to be much high, however, many investors remain in their investment properties because they do not know where to put their money after they sell. The favorable market, prices them out of purchasing another rental property at a good price. In this case, a Sell High, Buy High strategy does not make sense either. In the end, it has only been those investors who are ready to retire from active real estate investments, who have taken this opportunity to bow out of the market. Further data in the report which was sent out by The Mike Brown Group, shows that home sales in December dropped by 16% to 766 homes. Much of this can be attributed to the seasonality of the market which will make it more critical to watch these numbers in the ensuing months. While the overall number of homes has decreased, the available inventory remains very low at 2.18 months. This is to say that the existing home inventory would take roughly 2 months to sell off. A “normal market inventory would come in at around 5-7 months by comparison. 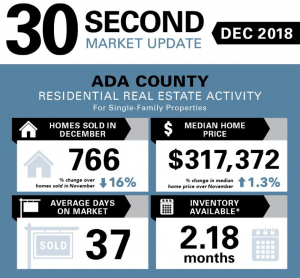 There is still more buyers than available homes in Ada County. Canyon County Single Family Market Figures. In Canyon County the situation is slightly different. Median home prices in the west end of the valley are tracking at $223,995, over $90,000 less than the median price in Ada County. This price, however shows more than double the price growth with a 3.4% increase. So while the Canyon County median home price is lower, it is increasing a faster rate than that of Ada County. On the tenant side of the equation, we have seen a disproportionate number of tenants moving to the Nampa/Caldwell areas as a result of these prices. Part of this steady month-over-month price increase is due to the lack of inventory. Canyon County comes in at 1.96 months as compared to 2.18 months for Ada County. The lack of available homes is in part contributing to the decreasing monthly sales numbers. December shows a decline in total home sales by 19%. Only 322 homes sold in Canyon County as compared to 766 homes in Ada County. 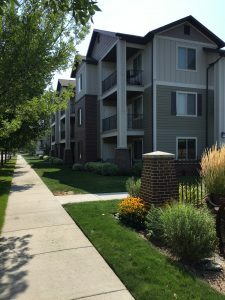 Vacancy rates for multi-family housing in the Treasure Valley have continued to remain low for the first quarter of 2018 driving the continued construction of multi-family projects. 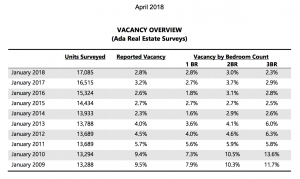 The latest Vacancy Overview produced by Valbridge Property Advisors indicated a reported vacancy of 2.8% as of January 2018. This is down from 3.2% recorded for January 2017. The report covers most municipalities in the greater Boise area and includes roughly 17,000 units. The comprehensive report suggests strong indicators that the multi-family housing market will continue to build in the coming months. According to the report, while vacancy rates remain low, average rents have continued to increase rising roughly 12% from 2017 to 2018. Rental data is based on a per square foot price averaging $1.02 per square foot in 2017 and $1.14 per square foot so far in 2018. This overall average may appear to be high given that the report is biased toward newer properties, however, the rise in rental rates and continued low vacancy suggest that demand remains high for multi-family units. Because the market remains favorable, projects continue to be proposed and permitted across the region.